EXCLUSIVE AT NET-A-PORTER.COM. BY FAR's 'Tanya' mules are coveted for their '90s-inspired minimal silhouette - Lucy Williams, Jeanne Damas and Bella Hadid are all huge fans. 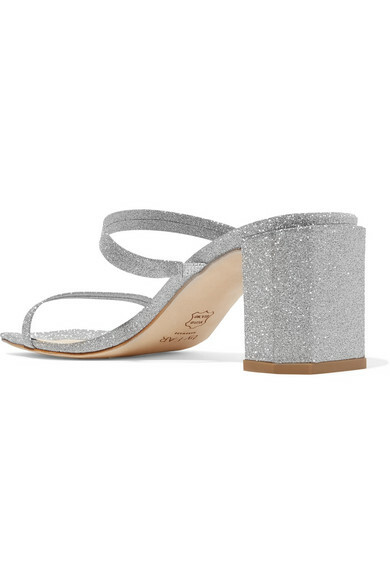 Defined by a square toe and sculptural geometric block heel, this style has been updated especially for us in sparkly silver glitter. They're beautifully made and have two slender straps that frame your foot. Pair yours with everything from ankle-cropped jeans to mini dresses. Shown here with: Dundas Top, Goldsign Jeans, BY FAR Tote, Magda Butrym Choker.